Home » » Enugu community demands N50m compensation from govt over land. Enugu community demands N50m compensation from govt over land. The ongoing clearing of large hectares of land at Ogbagu Agbani community in Nsukka Local Government Area, Enugu State for an alleged housing estate in the area is raising dust as indigenes of the community in a peaceful protest told the state government to pay compensation for food crops and economic trees worth over N50 million which were allegedly destroyed at the site of the proposed housing estate. The indigenes, wailing while bearing placards protesting the destruction of their cash crops, yam farms, yellow peppers, fruited pumpkins, coco- yam farms, vegetables and economic trees in the course of clearing the large hectares of land at Ogbagu Agbani community, said that the state government did not give them notice to remove the crops before embarking on clearing the site for the housing estate in the area. Speaking during the peaceful protest, the chairman, Ogbagu Agbani Land Committee, Chief Onogwu Obayi Ikechukwu from Agbani quarters of the community, said that the community is not against the state government developing the area but that the community has to be consulted and agreement reached for whatever project the state govermment had in mind which definitely would create employment for youths of the community. “We are protesting to let the state govermment know that we deserve the right to be consulted and given notice before encroaching on the said land which belongs to Ogbagu Agbani community. 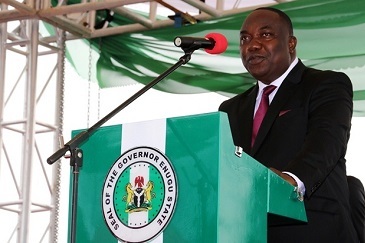 “We are a peace-loving community that appreciates the good goverance of Ifeanyi Ugwuanyi on roads network, infrastructural development, human and capital development among others.